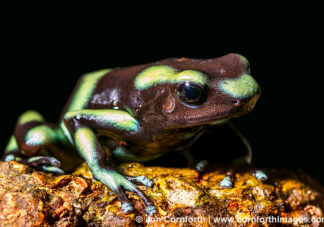 View green black poison dart frog photos, license green black poison dart frog stock pictures, and buy stunning green black poison dart frog prints by award winning professional photographer Jon Cornforth. To license an image for editorial or commercial use, click on the License Image button and fill out the form. To purchase a fine art print, select your image size and presentation style before clicking on the Buy Print button. 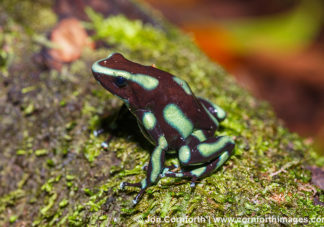 The green-and-black poison dart frog is a brightly colored frog native to Central America and parts of South America. However, the frogs also live, as an introduced species, in some parts of Hawaii. Males average 0.75 inches (1.9 cm), while females are slightly larger. The frog typically displays mint-green coloration. However, this pigment can be forest, lime, or emerald green. Some unusual versions of this frog are turquoise, or even cobalt blue or pale yellow. Mixed with the typical green are splotches of dark color, ranging from wood brown to black. This frog finds shelter in humid lowlands from southeastern Nicaragua on the Atlantic slope and southeastern Costa Rica on the Pacific coast through Panama to northwestern Colombia. Long ago, people introduced this frog in Oahu for mosquito control. However, since then, the frog has migrated to Maui as well.